I inherited some fabulous Motherhood shirts from Mrs. Fussypants last week. THEN found a $3 maternity closeout at Walmart. See how her clothing smarts are helping me make the most of my maternity money! i stumbled across the $3 closeout at Walmart yesterday by accident! I was at the checkout with my $9.98 maternity shirt still contemplating on whether or not I wanted to spend the $ on it and then the cashier scanned it...low and behold it was only $3!!! I'm going back today in hopes they still have some! Wow, really good price on the maternity clothes Meredith. Like you, I am a fan of cotton - and the cotton with a touch of lycra blends are terrific - always lookng crisp and fresh. 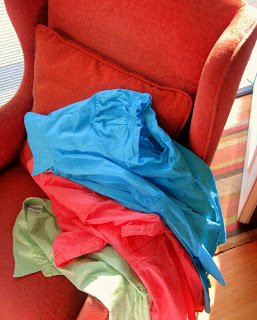 If you slightly dampen your clean cotton shirts and stick them in a bag for 10 minutes before ironing, they will press beautifully and stay crisp longer - even in humidity. Honestly! It has been almost eight years since my last maternity outfit, so I can't speak from current experience there, but generally it is better to buy good quality than large quantities. Cheap knits always look cheap and like you've noted, they just don't hold up well. Better to look for something a bit better made. I scored an Eddie Bauer knit skirt still with $45 tag on at Goodwill the other day - now there is some quality knit. I can guess I'll get at least 3-5 winters out of it - if I don't change sizes or have a major spill! Enjoy the new clothes and feel good in them! Thanks for the article! My best friend is expecting her first baby, so I'll be passing it along to her.